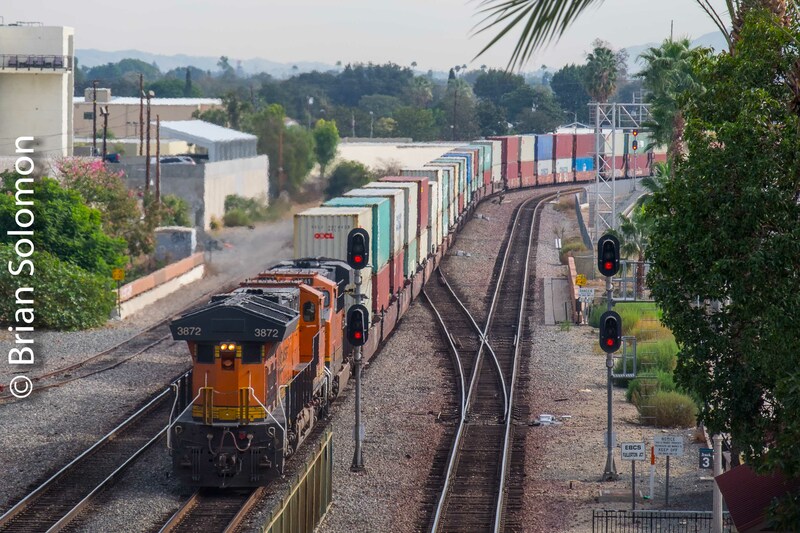 Last November, on my trip to Southern California, I made this view of a westward BNSF double stack train passing Fullerton, California. Large mural paintings portraying vintage picture postcard decorated the side of a multistory car park on the north side of the line. Bright California sunshine and the juxtaposition between BNSF’s modern GE diesels and old color postcard made the scene for me. 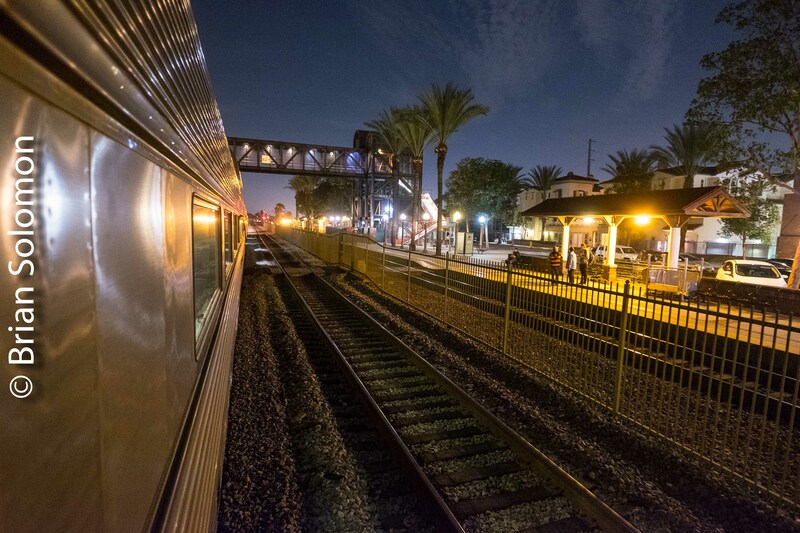 Tracking the Light Extra: Fullerton by Night—Dome Car on the Southwest Chief. 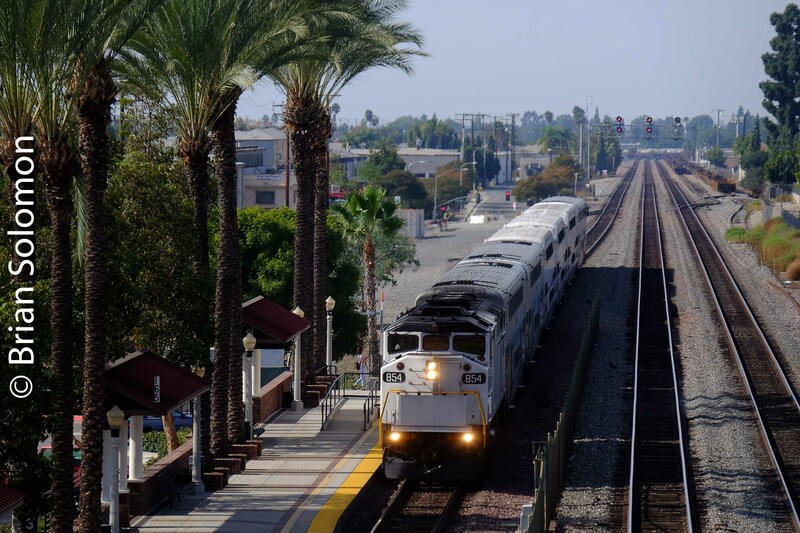 Saturday evening, November 17, 2018, Amtrak’s Southwest Chief—train number 4—made its scheduled station stop at Fullerton, California, its first after departing Los Angeles Union Station. Budd Vista Dome Silver Splendor was in consist on its big trip east. The dome was met by some of its California fans who waited trackside to see it off on its journey. 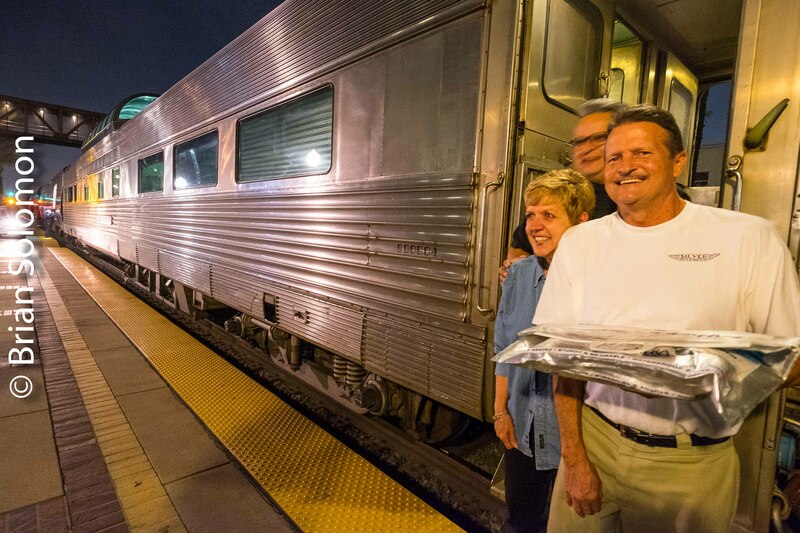 Silver Splendor was making the trek to its new home on the East Coast after many years entertaining travelers in the West. 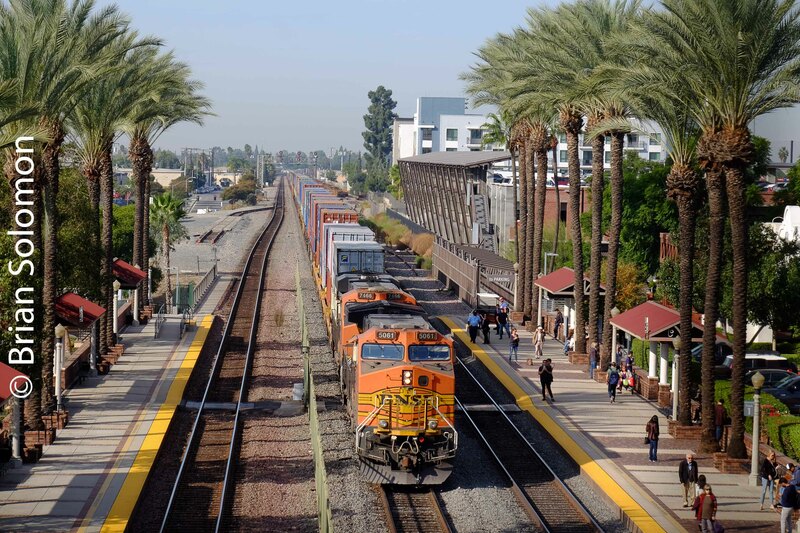 Amtrak’s Southwest Chief, train no.4, pauses at Fullerton, California. 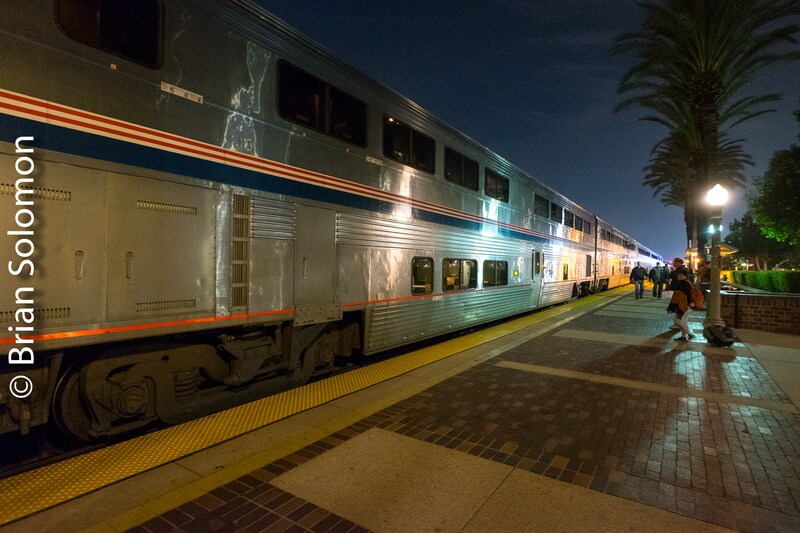 Former Chicago, Burlington & Quincy Budd-built Vista Dome on Amtrak’s Southwest Chief at Fullerton, California on November 17, 2018. A view East on the old Santa Fe at Fullerton. Seven hours earlier I’d been making photos from that footbridge. I exposed these views hand-held using my FujiFilm X-T1. Tracking the Light Posts Everyday, sometimes twice! 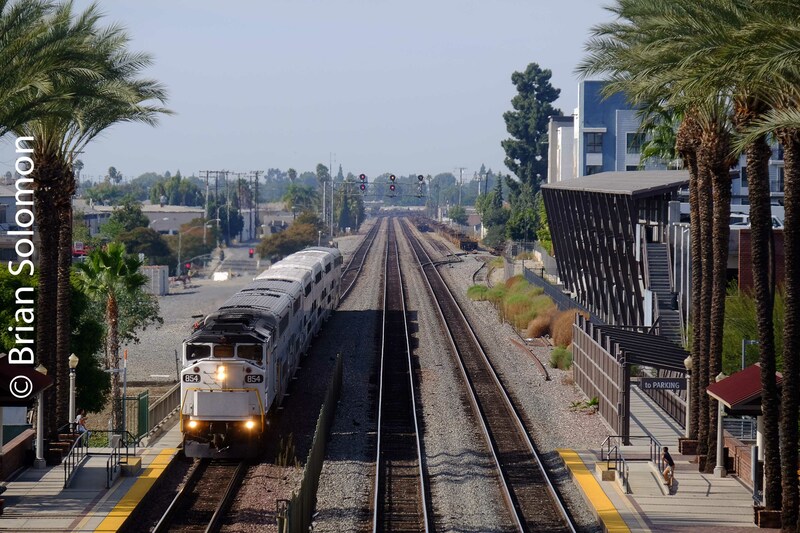 Amtrak 768 at Fullerton—Two Perspectives. 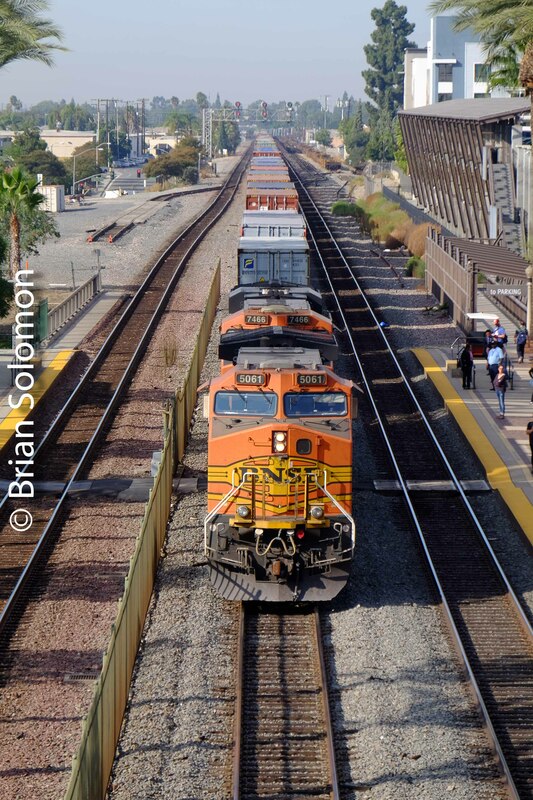 On my theme of ‘getting the angle right’; or rather how slight adjustments in elevation can alter perspective, compare these two recent views of Amtrak 768 Pacific Surfliner at Fullerton, California. Both were made with my FujiFilm XT1 digital camera and a telephoto zoom lens. The top view was made from my standing height and aims to include the footbridge. With the bottom view, I’ve taken a more extreme telephoto focal length while placed the camera very near to platform level. Composition was aided through use of the fold-out rear display. This allows me to hold the camera near to the ground while being able to look down to see the image. (A handy feature of the XT1). The low angle telephoto is a good means for making a more dramatic view. A photograph made from my normal standing height. Here I’ve aimed to include the footbridge. For this more dramatic perspective I’ve held the camera very close to the platform-level for a sort of cat’s eye view. The combination of a long telephoto lens and this abnormally low angle makes for a dramatic photo. Back in the 1990s, I made many of these views on film using my Nikon F3T by removing the prism and looking straight down into the viewfinder.